Funny little short … again, thoughts of the camera as a gun made explicit, if slightly ludicrous. Dueling Cameras from lonelysandwich on Vimeo. Elizabeth posted a great ad on her blog, so I thought I’d follow up with one on my own. Although this commercial is riff off of freeze tag, there are interesting parallels to other things we’ve looked at in the course as well – stopping time, cameras and the ‘pursuit’ or hunting, Sontag’s violence of the image, etc. 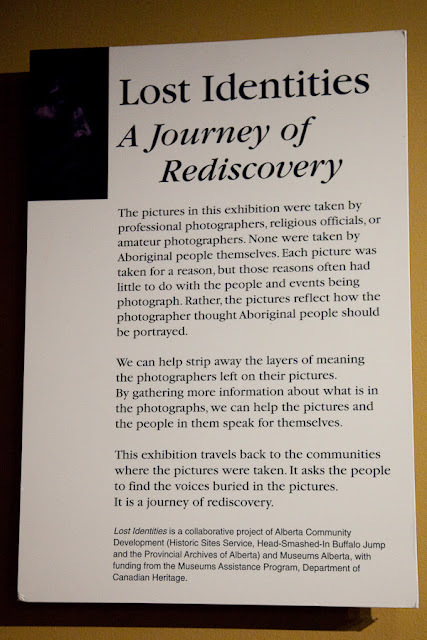 The 5702f readings this week featured a few references to “Lost Identities” ; here’s some panels from that project that were part of a display at Head-Smashed-In Buffalo Jump, which is located in the foothills of southern Alberta (close to the Piikani and Kanai Nations, but not on reserve land). 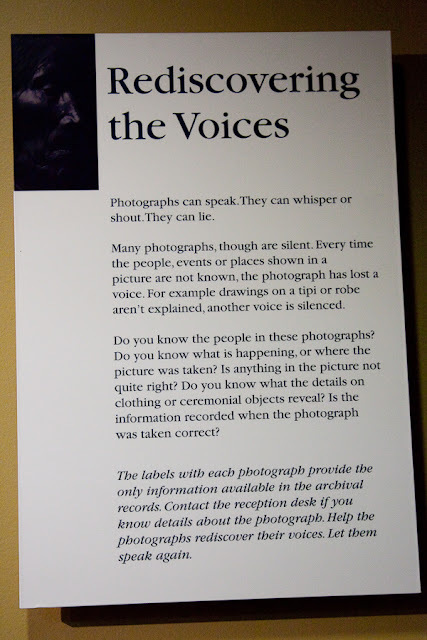 I particularly find some of the text interesting in what it assumes that photographs can do. 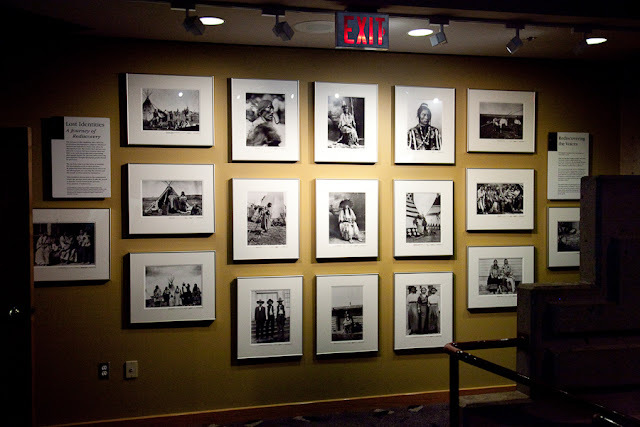 Some of these photographs come from the Ernest Brown collection, which is a large part of my current book project. On a long drive with the family to visit a friend’s cottage, we drove through a small town that had a tavern with this sign. I saw it … thought about it all weekend … and on the drive back to Ottawa I just had to stop and take a picture of it. In Canadian Social History I lecture on taverns as gendered spaces, of a time when women were excluded from them, except, occasionally, through separate doors and separate areas that were designated for “Ladies & Escorts.” There’s something about how signs narrate past realities that is quite haunting. Seeing spaces of the past is one thing, but reading the very discourse of exclusion in such public spaces signals something even more real to me than investigating the interior space itself. The materiality of the signage, the letters, the exposed bulbs all combine to mark off the dull brick building as a site of something more than a run-down bar. 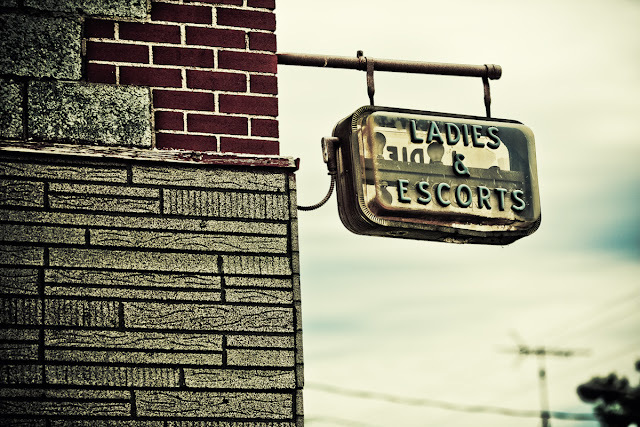 We read the sign differently now (indeed, “escorts” takes on a very different meaning in the classifieds and craig’s list). Maybe I’ll recycle this image into my lecture this year … maybe there might even be a student or two from the town. In its own way, I guess I see (or hope) that the sign embodies what Marlene Creates calls “hidden histories and invisible stories“.